This document is intended to provide general guidelines for understanding which NoMachine products and licenses are necessary to set-up highly available access from one centralized location to physical desktops on remote Unix-like stations not running NoMachine software ('foreign servers'). A NoMachine multi-server infrastructure is made up of a central server, called 'main server' or 'federation server' that allows federation and administration of other server hosts. It acts as a single point of access to a scalable number of server subsystems and can work in conjunction with a secondary central server (a two-server failover cluster) for high-available (HA) access. Only NoMachine Cloud Server can be a federation server, i.e. has the capacity of federating other servers. It's available for Mac, Windows and Linux. All the other NoMachine servers can work as standalone servers or can be federated under a Cloud Server. Foreign servers, which can be also federated under a Cloud Server, are a particular case since they run unsupported Unix-based platforms. They are Unix-like hosts supporting the X-Windows system but running an O.S. for which we don't build native packages, e.g. HP_UX, AIX and BSD. Such hosts can be federated under a NoMachine Cloud Server, but we qualify them as 'foreign ' to distinguish them from 'NoMachine servers' which run instead a NoMachine server software. NoMachine Cloud Server is able to handle such foreign servers and permits the access to their physical desktops through X11 forwarding over SSH. Users will connect to the Cloud Server which acts as a single point of access to those hosts behind. In this document we will see what is necessary to set-up centralized access to multiple foreign servers and maintain high availability access to their remote physical desktops by means of a second Cloud Server, associated to the first one in an active/passive failover cluster. If the active Cloud Server fails, this second Cloud Server takes its place to grant business continuity. This solution is suitable for medium/large business, even to offer access to critical business 'legacy' applications whilst still providing an easy-to-use contemporary environment. 1 NoMachine Cloud Server license for the main server host, Mac, Windows or Linux. 1 NoMachine Cloud Server license for the secondary server host (Mac, Windows or Linux) if you need to set-up the failover cluster for HA access (optional). On the end-user's computer install NoMachine Enterprise Client (which is free to use) or connect by the web via browser. 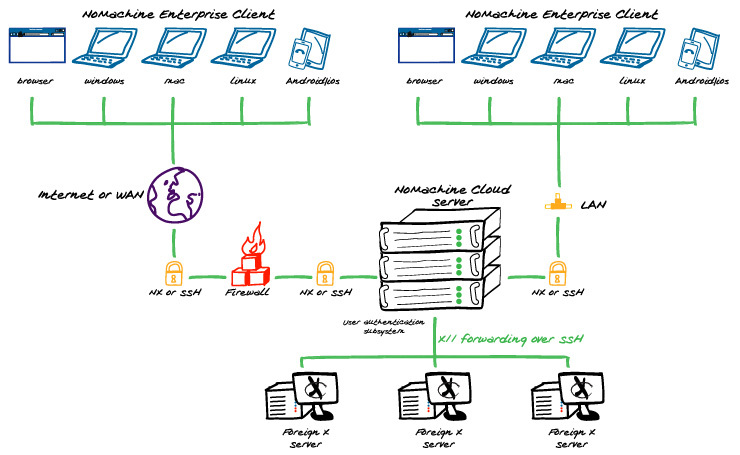 1 NoMachine Cloud Server on a Windows or Mac or Linux host (1 machine called "A"). 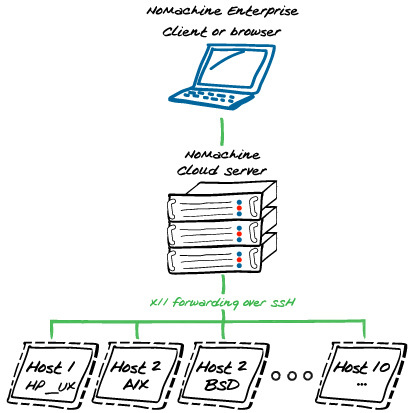 1 NoMachine Cloud Server on a Windows or Mac or Linux host (1 machine called "B"). NoMachine client-server connections can be over the internet or in a private network (LAN or VPN) and in both cases via SSH protocol or NX protocol. Connection between NoMachine Cloud Server and any of the foreign hosts is instead via SSH. The solution is totally scalable in that further foreign servers can be added at any moment. Additionally, it's also possible to set-up mixed environments with foreign servers and NoMachine servers. Both the Cloud Server host and the remote server host can be either a physical computer or a virtual machine.